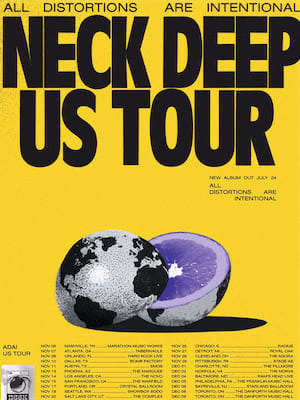 Don't miss the heady bubblegum pop-punk of Welsh alt rock outfit Neck Deep as they hit the road to celebrate the 2017 release of their third studio album The Peace and The Panic. Calling to mind the glory days of Blink 182, New Found Glory and Fall Out Boy, the quartet have risen to the forefront of the current pop-punk revival with supercharged teen anthems comprised of fuzzy power chords, pounding drums and hook-laden melodies. Frontman Ben Barlow mines the depths of his soul for lyrics that reflect broken relationships, small-town angst and the uncertainty of growing up, yet their upbeat songs regularly have audiences on their feet moshing and moving. The band's ability to emotionally empathise with their target audience has garnered them legions of fans around the world, whilst their mastery of escapism and penchant for killer tunes keeps those fans coming back to exciting, cathartic live shows. Sound good to you? 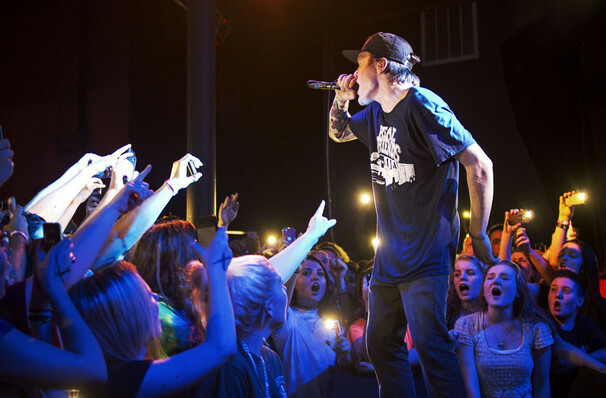 Share this page on social media and let your friends know about Neck Deep at Boulder Theater. Please note: The term Boulder Theater and/or Neck Deep as well as all associated graphics, logos, and/or other trademarks, tradenames or copyrights are the property of the Boulder Theater and/or Neck Deep and are used herein for factual descriptive purposes only. We are in no way associated with or authorized by the Boulder Theater and/or Neck Deep and neither that entity nor any of its affiliates have licensed or endorsed us to sell tickets, goods and or services in conjunction with their events.